I am a Calvinist, allow me to explain what that does not mean, and also what it does mean. That does not mean that I follow a man named John Calvin. I am a believer and follower of Jesus Christ alone. 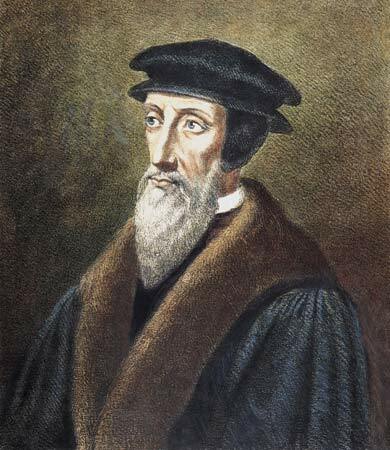 John Calvin is a Christian theologian who lived and wrote in Geneva, Switzerland during the reformational period of the Christian church of the 16th century. Geneva, Switzerland became the center of the reformation, it was a place that men could live free from the persecution of the Roman Catholic Church. Calvinism is the Christian theology that arose during the reformational period of the Christian church. Later other theologies would arise as well, therefore, to distinguish between them names were attached to these varying theologies. Calvinism was never called such during John Calvin's life time. Calvinism is the belief that God is sovereign over all created things. Men are created by God, therefore, God is sovereign over the salvation of sinful man. An English Christian preacher, pastor and writer from the 19th century said this about Calvinism. "For the essence of Calvinism is that we are born again; not of blood, nor of the will of the flesh nor of the will of man, but of God." (C. H. Spurgeon). He was referring to the conversation that the Lord had with the Pharisee Nicodemus in which "Jesus answered and said to him, "Most assuredly, I say to you, unless one is born again, he cannot see the kingdom of God." (John 3:3 NKJV) He was also referring to the introduction of the Gospel According to John: "who were born, not of blood, nor of the will of the flesh, nor of the will of man, but of God." (John 1:13 NKJV). Calvinism is both loved by many and hated by many others. Now why would anyone hate that God is sovereign over the salvation of men? If God has saved you, giving you faith in His only begotten Son Jesus Christ you should thank Him by giving Him all the glory. There are only two viable answers as to why someone would hate that God is sovereign over the salvation of men. They either don't want to believe that God hates, or they want to have a part in their own salvation. Can you honestly read the 66 books of the Bible and believe that God does not hate? The God of the Bible ordered the destruction of entire nations and people groups. "Just as it is written, Jacob I loved, but Esau I hated." (Romans 9:13) Two brothers from the same father Isaac and mother Rebekah (Romans 9:10) neither of which deserved the grace of God. Jacob is the father of the Israelites, while Esau the father of the Edomites. The Edomites no longer exist they were destroyed, but the Israelites do exist as the Jews. The second is the same lie the serpent told the women, "you will be like God". The moment that you sinned you died spiritually, God is Spirit, you are not like God but dead in your trespasses and sins. Dead men do not rise up on their own, they must be raised from the dead, and only God can raise the dead. The Bible talks about sheep and goats, all men are either a sheep or a goat. Currently the sheep and the goats are living among one another in the same pen, which is the world. At the judgment on the last day Jesus will separate the sheep and the goats. "31 But when the Son of Man comes in His glory, and all the angels with Him, then He will sit on His glorious throne. 32 All the nations will be gathered before Him; and He will separate them from one another, as the shepherd separates the sheep from the goats; 33 and He will put the sheep on His right, and the goats on the left." (Mat.25:31-33). The sheep to eternal life: "Then the King will say to those on His right, 'Come, you who are blessed of My Father, inherit the kingdom prepared for you from the foundation of the world." (Mat. 25:34). The goats to eternal destruction: "Then He will also say to those on His left, ' Depart from Me, accursed ones, into the eternal fire which has been prepared for the devil and his angels" (Mat. 25:41). We preach the Gospel to all with the hope that all who hear will be saved, but we also have the knowledge that God has elected whom He will save. "25 Jesus said to her" I am the resurrection and the life; he who believes in Me will live even if he dies, 26 and everyone who lives and believes in Me will never die. Do you believe this?" (John 11:25-26). Jesus has promised eternal life to all who believe in Him; "who were born, not of blood, nor of the will of the flesh, nor of the will of man, but of God." The gospel is about the righteousness of God, repent and believe in the gospel. If God has saved you, giving you faith in His only begotten Son Jesus Christ, then thank Him by giving all the glory for your salvation to God. Holy Bible, New King James Version. (1982). Thomas Nelson, Inc. Note: I primarily use the New American Standard Bible in all my reading and writing, but when citing from the first 5 chapters of the Gospel According to John I use the New King James Version, because I have memorized those chapters in that version, therefore they are part of my thinking.